President Akufo-Addo has arrived in the Northern Regional capital, Tamale, ahead of Friday’s historic outdooring of the new Yaa-Naa, Abubakari Mahama ll, as the overlord of the Dagbon traditional area. A protracted chieftaincy dispute has left the kingship role vacant since 2002. The Savelugu Naa, Abubakari Mahama ll, was among four persons whose names came up as possible successors of the late Ya-Naa whose funerals have all been performed. President Akufo-Addo was met on arrival by the Northern Regional Minister Salifu Saeed, the Defence Minister Dominic Nitiwul, Interior Minister Ambrose Dery, the Information Minister Kojo Oppong Nkrumah, and regional executives of the NPP, as well as citizens of the Dagbon traditional area. A ceremony to outdoor the new Yaa-Naa is expected to attract traditional rulers, religious groups, civil society organizations, representatives of political parties and social groups, as well as thousands of Dagbon residents. President Akufo-Addo is reported to be delighted that his efforts at resolving the conflict once and for all have been fruitful. The Head of European Studies at the University of Ghana, Professor Yaw Gyampo, has commended President Nana Akufo-Addo for the role he played in ensuring the implementation of a road-map to peace in Dagbon. 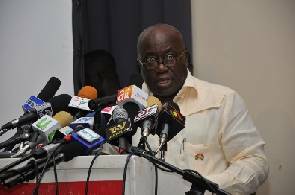 “President Akufo-Addo deserves some commendation. Under his presidency and through his instrumentalities (including boldness and tactfulness), the road map towards peace in Dagon has fully been implemented and Dagbon has selected a new Overlord,” he said in a statement. He also commended previous administrations for laying the groundwork for the successes in Dagbon.